The Organization for Security and Co-operation in Europe (OSCE) has decided to extend the mandate of the Special Monitoring Mission in Ukraine for one year, as well as increase the potential number of its observers to up to 1,000 people. "The decision was adopted today [by OSCE member states]. The mission can now have a size of up to 1,000 according to the circumstances. The mandate was also extended to March 31, 2016," spokeswoman Mersiha Podzic said, as quoted by AFP. The decision was backed by all 57 OSCE member states during a Thursday session at the organization’s Vienna headquarters. Funding of the Special Monitoring Mission (SMM) was one of the main issues discussed at the meeting. As the responsibilities of the mission have broadened under the Minsk-2 agreement, OSCE member states need to increase their contributions, an OSCE source said, according to RIA Novosti. The total budget of the mission had been earlier estimated at about €85 million (US$90 million). The new tasks of the OSCE monitors are based on the February agreements of the Normandy Four group in Minsk – including the monitoring of ceasefire implementation in eastern Ukraine and the pull-out of all heavy weapons by both sides. “The ceasefire holds broadly along the long contact line” in the Donbass region, with crossfire continuing in some places but at “a lower level,” Hug said, according to AFP. "In general it is positive that most of this fighting is being conducted with small arms and smaller calibre weapons and it's an indication that heavy weapons have actually been withdrawn and are not being used as often," he said. 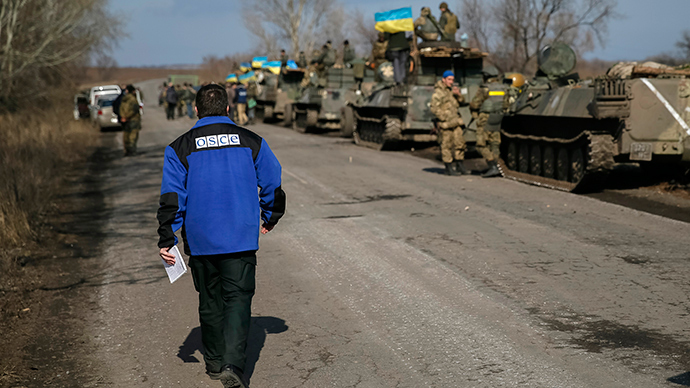 Last week, OSCE Special Monitoring Mission in Ukraine spokesman Michael Bociurkiw reported that the number of ceasefire violations in war-torn eastern Ukraine was dropping, though the withdrawal of heavy armaments by both sides of the conflict couldn’t be confirmed. Commenting on the results of the Thursday session, Russian Ambassador to the OSCE Andrey Kelin said the adoption of a political resolution in support of the OSCE mission was sabotaged by US and Ukrainian diplomats and reduced to a technical decision, TASS reported. Kelin said the amendments suggested by the Ukrainian side were aimed at rewriting the Minsk agreements. The conflict in eastern Ukraine broke out last spring, when Kiev sent its military to crack down on militias in the Donbass region. Over 6,000 lives have been lost and more than 290,000 have been forced to flee into Russia alone.